Yesterday, we joined the #savestorm movement to save the solo comic Storm from cancellation. But the question needs to be answered whether Storm is worth saving. This is often the argument when minority and female-led comics get cancelled, that the comic "just wasn't good enough." Of course, most of the people making these statements have never actually read the comics. They just assume that if the comic was good, it would sell. Since it didn't sell, it couldn't have been good. Never mind the fact that Marvel can release five Wolverine comics at a time without anyone once questioning the quality of the writing, let's tackle this head on. Set aside the fact that cancelling Storm will set a precedent for cancelling other black and female solo comics before they start. Do the reviews justify saving Storm? The answer is yes. Let's start with issue #1. Comic Book Roundup gave it an overall rating of 7.7 out of 29 reviews. Newsarama gave Storm #1 a 10/10, saying "[Writer] Pak has written a masterpiece of Ororo rediscovering who she is and what she cares about." IGN praised Storm #1, saying "The strong character work and excellent art make it a debut worth checking out." Comic Book Resources gave Storm #1 four and a half stars, saying that "Pak, [artist] Ibanez, and [colorist] Redmond have done Ororo great justice in creating such an inspiring, uplifting series for her with befitting subtlety and grace." It looks like the first issue hit a home run, but what about the second? Comic Book Roundup gave #2 an even higher overall rating of 8.0 out of 9 reviews. 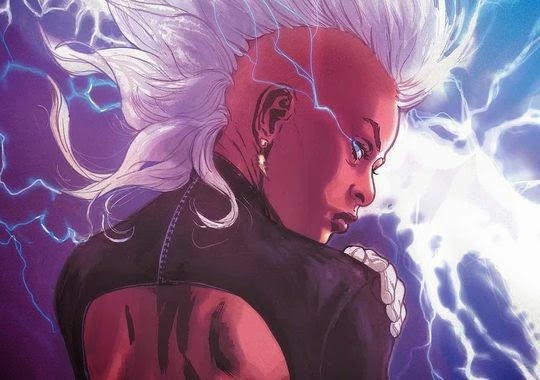 Comic Book Resources gave it three and a half stars, and said, the continued development of Storm in this second issue is strong overall" and "Ibañez's art is even stronger in this issue." Geeked Out Nation gave #2 an 8.4, and said, "Storm #2 is a step in the right direction and gives us the best of both worlds with Ororo." IGN gave it an 8.5 and said, "Pak shows a firm handle on Storm as a character." Den of Geek raved about it, saying, "X-Men's Storm finally has her own comic book, and it's a great one." Still not convinced? Why not make up your own mind? You can download the first issue of Storm for free on Comixology with the code "stormchasers" until 12/1. And of course, you can buy the latest issue online or in your local comic shop. I haven't read it but I should go download that free one. Yes, but what do you guys think of it? I can think of plenty of quality comic books that were cancelled or had poor readership. It's practically par for the course. I read the link yesterday with writer Greg Pak explaining the "Death of Wolverine" issue, and I had to ask myself, Storm really had a significant relationship with Wolverine? It's that kind of reasoning, no matter how much I respect Pak, that leads me to question how or why a series like this is justified, at least in this current iteration. This being comics, even a cancelled series is hardly the end of a character's viability to launch another one. When the latest Static series was cancelled, its poor critical drubbing set the character back significantly (with no trace of him since). Storm, by your own account, is hardly in that position, and being one of the most notable X-Men, she would hardly disappear. I remain unconvinced to support this campaign. We are Christian Organization formed to help people in needs of helps,such as financial help.So if you are going through financial difficulty or you are in any financial mess,and you need funds to start up your own business,or you need loan to settle your debt or pay off your bills,start a nice business, or you are finding it hard to obtain capital loan from local banks, for the bible says”"Luke 11:10 Everyone who asks receives; he who seeks finds; and to him who knocks, the door will be opened”so do not let these opportunity pass you by because Jesus is the same yesterday, today and forever more.Please these is for serious minded and God fearing People. You are advise to fill and return the details below.. Conditions Asap in order for us to proceed. I will be looking forward to hear from you so as to proceed. Please all borrowers you have to get back to us with this details as listed to enable us proceed on the loan terms and repayment schedule asap. tonywelshloanfirms@gmail.com to get your instant loan of any amount at any destination. with reference to securing a loan with low interest rate of 2% and better repayment plans and schedule,please contact Mr. Apply now for all kinds of loans and get money urgently! * Choose between 1 and 40 years of repayment. * Terms and conditions of the loans flexibility. Welcome to Mr Michael David Loan Company...we issued any type of loans to Applicant who is in need of an urgent loan financial assistance and to whom the bank denied them from having credit and we are legally backed by the government. I must tell you,That in this company we give maximum satisfaction you can ever desire. All that is required of you as a borrower is genuine information about yourself, if you are interested in our ads. Good day Audience. I am Allice James a single mom, from Ohio USA, i want to use this great medium to announce this lender Mr Joshua Brown who is really a God sent to my family. few months back i was in search of a loan form the internet where i was scammed of $3000.00 i never thought i will ever apply for a loan on the internet again before i met a post about this lender made by one Monica Carlos who also got a loan from him, then i took a try again, after loan processing i was ask to provide my banking details which i did and to my greatest surprise i was granted a loan of $45,000.00 at first i thought it was a joke until i got to the bank to confirm and it was true, i was overwhelmed with joy. so i want you all who desire a loan and are capable of paying back the funds at the due time to contact:(fidelitybankloanoffer4@gmail.com) and be a partaker of my testimony.